There are a few changes in store for the 2012 Toyota Venza. The Camry-based mid-size crossover adds trim lines for the new model year. Previously coming without trim designations the Venza now has LE, XLE, and Limited trims similar to the Camry. 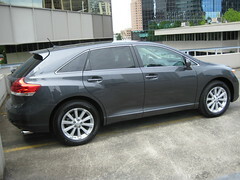 While the Camry is all-new for 2012, the Venza otherwise returns relatively unchanged. The Venza is offered with essentially the same engines as the Camry. The LE offers the 2.7-liter 182 horsepower four-cylinder engine and comes standard with a six-speed automatic transmission, Bluetooth, six-disc changer, power driver’s seat, dual-zone automatic climate zone, and auxiliary and USB input. The Venza is rated at 21-mpg city and 27-mpg highway with front-wheel drive. There is no Venza Hybrid but there is the Toyota Highlander Hybrid, a larger three-row sibling. The Venza XLE offers buyers a choice of the four-cylinder engine or much more powerful 3.5-liter 268 horsepower V6 engine. The Limited comes with V6 only and comes standard with leather seats and a JBL Synthesis surround-sound audio system. Navigation and a panoramic sunroof are both options. All V6 models have standard 20-inche five-spoke aluminum allow wheels. Both trims have available all-wheel drive. The 2011 Venza had fuel economy of 18-mpg city and 25-mpg highway with the V6 and all-wheel drive. This is slightly better than competitors such as the Ford Edge and Nissan Murano. The Venza does not offer a third row of seats and has available 3,500 pounds of towing capacity with the V6. The Venza is a true crossover that has a lower ride height than most of its competitors. It drives more like a Camry than an SUV but also offers roominess, versatility, and cargo area. 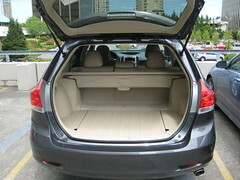 The Venza has 34.4 cubic feet of cargo room behind the rear seats and 70.1 cubic feet of room with the rear seats folded flat. In comparison, the 2011 Jeep Grand Cherokee has 35.1 cubic feet behind the second row and 68.7 cubic feet with the rear seats folded. The 2012 Venza comes with 7 standard airbags including front and rear side curtain airbags. It also has hill-start assist control and active head restraints. The 2011 Venza made the Insurance Institute For Highway Safety’s list of safest midsize SUVs. Pricing on the trims has not yet been announced. The 2011 Venza had a starting MSRP of $27,125 with a fully optioned V6 with all-wheel drive topping out at near $40,000. The Venza is assembled at Toyota’s Georgetown, Kentucky Plant. More than 70-percent of the model’s parts are North American sourced. It is a strong competitor in the midsize crossover class. Which is your favorite five-seat midsize crossover for under $35,000?